Got noise? 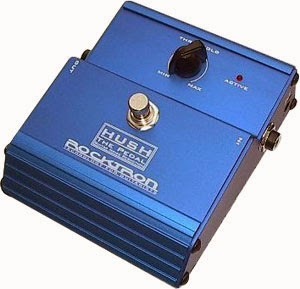 Get the world’s foremost noise reduction for guitar players, Rocktron’s HUSH®. The HUSH pedal needs no introduction, as it is easily the standard in most touring rigs worldwide since 1984. If you aren’t using the HUSH, you aren’t using real noise reduction for guitar. When used properly, the HUSH will wipe out hiss, unwanted feedback and pickup buzz. The HUSH pedal delivers 65dB of signal cleanup, while your music signal integrity remains unaffected. In other words, get rid of the noise without altering your tone! Guitar Player Magazine wrote that the "HUSH Pedal will work for all guitar-related noise problems: it’s perfect" and "its potent noise-killing abilities will be fully appreciated." Simply plug the HUSH in AFTER distortion boxes, wah-wahs, noisy vintage effects, or other noisy units and turn the Threshold knob until the noise goes away. It’s that easy! You will not find a more effective noise reduction. Unlike noise "gates" that chop off the end of your notes, or ruin your sustain, HUSH the Pedal is actually a form of single-ended noise reduction that tracks your signal all the way and pushes the noise floor below the point where your ear can hear the noise. It does not hurt your sustain or chop off the end of your notes. Simply use the Threshold knob to smooth out your signal while wiping out noise. This is the best friend a guitar player could have! Now hold on, partner. You must pay attention to the proper setup, with the HUSH pedal going AFTER your noisy stomp boxes. The HUSH is not designed to take the input directly from your guitar WITHOUT some processing happening between the guitar and the HUSH noise reduction. When setup correctly, with your signal going from your preamp and effects, or from your distortion and effects, into the HUSH, you WILL be amazed at how it will clean up the excess noise, including pickup buzz! The HUSH can also be used in your amplifier’s effects loop. However, if you are running multiple effects through this loop, the HUSH should always be the last dynamic device in the signal chain, but before digital delays or reverbs. The HUSH pedal incorporates the latest version of the HUSH discreet circuitry which also includes Rocktron’s patented Variable Integrated Release (V.I.R.) technology. V.I.R. technology utilizes a low-noise VCA with precision detector circuits to achieve the smoothest and most transparent noise reduction possible.